I am going to trust you with a secret. Well it isn't really going to be a secret if I post it on the Internet is it? The good thing is that whoever is lucky enough to stumble upon my humble little site here gets in on the secret too. It's really only me sharing, but it still nice to think of it as a yummy food secret. So let me get to the good stuff. I recently discovered, through some Internet trawling, a fantastic cake packet mix at Aldi supermarkets. Now I don't go into Aldi all that often, I mean you go in for a carton of eggs and you can end up walking out with a paper shredder, an exercise bike, an emergency beacon and a circular saw. I made the Aldi Cake Mix discovery via a search that lead me to a Vogue Living BBS. A subscriber indicated that the 'Hillcrest Vanilla Cake Mix' from Aldi that retails for 75c a box is an excellent cake mix. I always have poo pooed anything that comes in a box. It isn't because I am a snob, (well I kind of am when it comes to anything that I can make from scratch) it was because I was looking for a recipe to make my own plain cake mix. Then I found that this mix was apparently very good. Anyway I decided to take the trip to my local Aldi and see if this mix is as good as the person on the Vogue BBS claimed it to be. The box tells you all you need is 3 tbs of margarine, 2 eggs and 2/3 cup of milk. You just bung it all into a mixing bowl and beat for 3 minutes. I decided to give my 75c cake a little more love, taking the time to sift the mixture, use softened unsalted butter and I used eggs that were at room temperature. 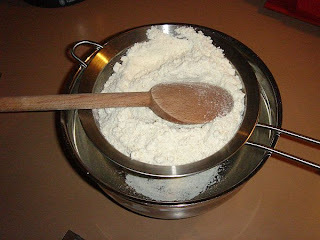 I did use my electric beaters (I kind of felt dirty not using a wooden spoon) and the mixture once incorporated was delightfully light, fluffy and very vanilla. It just goes to show,you really can't judge a book by its cover. There really is nothing wrong with trying something different or just believing in it enough to give it a go. I just won't look at the ingredients list on the box so I won't be horrified at all the additives... Anything is okay in moderation I guess. 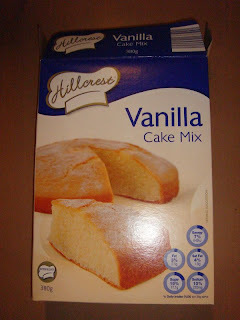 I have tried other supermarket 'No Name' brand cake mixes and have given them the same love and attention that I gave the Aldi mix, but this mix is the winner. If you can find it, try it because the results are really worth the 75c you pay for it and more! Preheat oven to 180C. Sift cake mix and cocoa into mixing bowl. Add rest of ingredients except for choc chips and beat for 3 minutes with an electric beater, making sure all ingredients are well combined. Add choc chips and using a wooden spoon, fold until well combined. 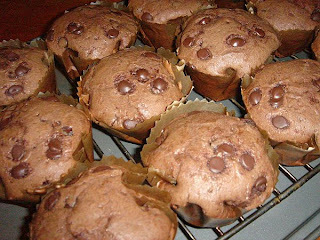 Spoon into muffin wrappers to about 3/4 full. Sprinkle on top with extra choc chips. Bake for about 15-20 minutes or until a bamboo skewer comes cleanly out of cake when inserted. Take some greaseproof paper or brown paper squares and make a stack of about 6 sheets. Draw a circle onto your top sheet of paper (use something like a small cereal bowl as a size guide) and cut your sheets out carefully. Sit the stack of paper circles over the middle of one of the holes of your muffin pan and use a smaller cup or the end of a rolling pin to push the stack of paper circles into the muffin pan hole. 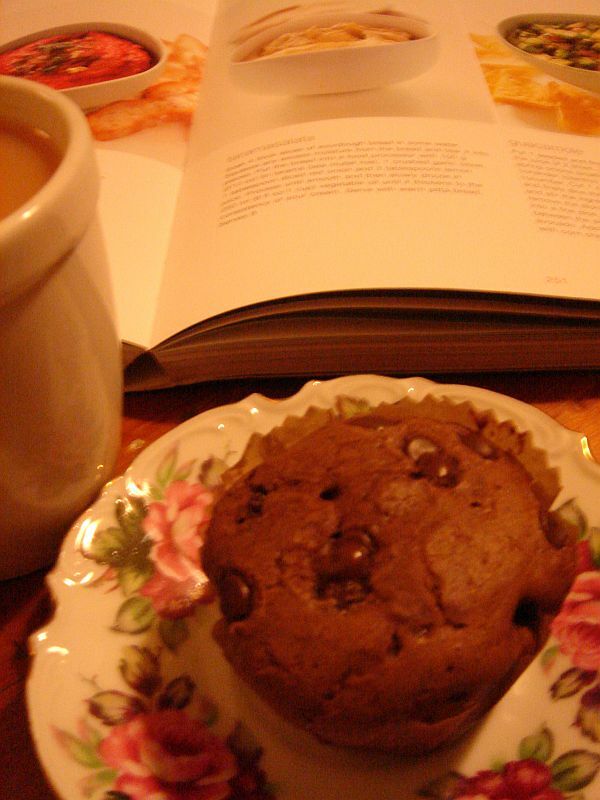 The paper will form pleats and take the shape of the muffin pan hole. Use as you would normal store bought muffin wrappers.